Chris - In 2008, the world of palaeoanthropology took a giant leap forward with the discovery in South Africa of a new species of early hominid. 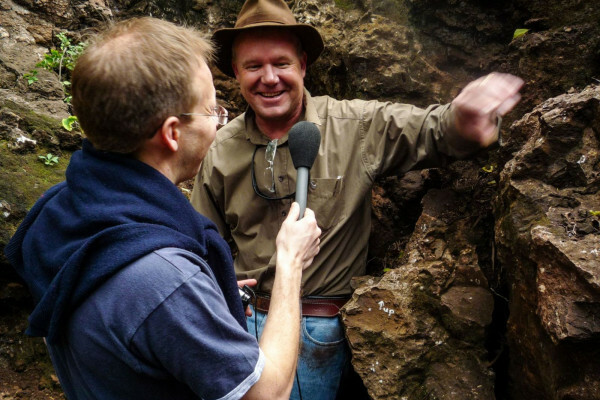 University of Witwatersrand scientist Lee Berger and his son Matthew had been out mapping potential fossil sites in the Cradle of Humankind World Heritage Site near Johannesburg. They had walked along the path made a century ago by miners who had partially excavated one area looking for lime and that's where Matthew spotted a block of stone containing the remains of what is now been named Australopithecus sediba. It was a 2 million-year-old specimen of an adolescent male, but with many features that are tantalisingly like our own. That block of stone was lying adjacent to a hole in the ground known as the Malapa Cave. And when Lee Berger investigated further, he uncovered a whole host of remains including an adult female sediba skeleton and many more that have yet to be removed from the site. Lee - We're walking up this little lime miner's pathway. This little road we're on dates back at least 100 years, maybe a little bit more. It was done by Ox sledges that they were dragging through here in order to access the cave sites. There are actually 86 caves in this little valley that we're sitting in. We can look to the north and see often to the rest of Africa in this beautiful wilderness area and then to the south of us here, a small valley that is littered with these caves and in some cases, fossil sites. The most important one that we've discovered so far is the one that we're walking in. These little shelter of trees that we're just passing under now marks the kind of perimeter of what is now a collapsed cave system. Two million years ago, where we're standing right now, we would've been standing 25 to 30 meters below the surface and over in front of us, if we've been at just the right moment, sometime around 1.977 million years ago, we would've seen a quite horrific death assemblage. There would've been bodies littered all over the surface in front of us - antelopes, sabre-toothed cats, and little mice and stuff. A leaf litter would've lying here and it would've been writhing with insects, feeding on these dead bodies. And stuck amongst them you would've seen figures and bodies of early human ancestors, these Australopithecines. Just over in front of us at about 1 o'clock would've been the body of a young male. He would've been lying just on top of a female who had her legs kicked back and her arms broken, lying underneath. There would've been an infant sitting just a few meters closer to us, lying right next to the body of a false sabre-toothed cat. And that instant is the snapshot that's preserved in time here. Fast forward 2 million years later and you have the image of flat ground with a small hole in it, bits of these ancient bed rock, the dolomite, collapsed stone because it's all eroded down to expose just right that moment in time. It's within that context that almost cemented in effectively, because that what this rock is that holds them, is this window into our past that accumulated probably over a few weeks, or at most, a few months of perhaps the richest early hominid site on the continent of Africa. Chris - So, you came walking up this path in 2008 and we've arrived in this little tree lined area and there is a hole on the ground. Is this pretty much what you saw when you walked up it? Lee - Almost precisely what I saw. In fact, almost exactly where we've stopped. I've been down in 2008 and I picked up a rock that was a sort of the size of a football or rugby ball and I turned it over and there on the other side of it, almost like this rock here was an antelope humerus - the arm bone of an antelope sticking out of it. I was on a mapping exercise that day on the first of August 2008. I looked around and I saw there were other fossils. I took some notes. I took a photograph of the site. I took accurate GPS coordinates, I walked up the hill and found the remainder of caves in this extraordinary environment. It was only when we returned 2 weeks later with my then 9-year-old son Matthew that I stood on the edge of this pit and as we walk a couple of steps forward, we literally almost recreating that moment when I was standing right here with Job Kibii, my son Matthew and my dog Tau and looking down, I said, "Okay, guys, go find fossils." As you can see around us, there are bits and pieces of this brown rock. That's where the fossils are. The ancient bone is sitting in those rocks and the right thing to do is just start picking up rocks around you right now. That's not what Matthew and Tau did. They were racing off to the left here, off into that high grass, away from the cave site. It was the wrong place to look, but I think they're off to chase some of these antelopes or giraffes that you've seen on the way. And Matthew stopped by that lightning struck tree. You can see this bizarre little hole in the ground and you can see where the tree has fallen over where it was struck by lightning. He found a rock. He said, "Dad, I found a fossil." I walked over towards him, 5 meters away from him, I realised that his and my life were going to change forever because sticking out of the side of that was the bone I've done my PhD on, a hominid clavicle sticking out of the side of it. How that rock got there? We still don't know. I don't think it was moved there by miners. There was nothing else in the vicinity of it. Maybe baboons had tossed it, just like the troupe of baboons we saw a few minutes ago. Had tossed it looking for insects underneath it to that point. Whatever the reason, that block held a not insignificant portion of a skeleton that we would later find littered throughout this area and in place in the wall of this cave just below us, I would then 2 weeks later find the adult female skeleton although we never imagined there were two at that time. And then discovery, after discovery, after discovery. Now, we have several hundred specimens of these individuals and other skeletons, just from this tiny little hole, and you can see we've done nothing. We have hardly removed anything. Every time we start removing even a tiny bit of this overburden that the miners had dumped on top of here and the couple of blasts that they put in, we find another skeleton and have to stop. It's a fantastic experience as an archaeologist or palaeontologist. Chris - It's an embarrassment of riches, isn't it? Were the miners not at all aware of what they walking on or walking over, or was there just no realisation at that time, how important this was? Lee - One of the reasons that we suspect that this was probably late 19th century mining. That is in the late 1890s or turn of the 20th century is that they didn't notice this. If this mining had occurred in the second phase which was after World War 1, sort of 1919 to 1925, by then you started to have an interest in these things, particularly in the third phase which moved into the late 1920s and 1930s. By then people like Raymond Dart were around and Robert Brume. Robert Brume walked this terrain. He was on this farm. He walked in the footsteps of where we've just been. If those miners had found this, I think they would've told him. What is remarkable is how this site was missed and I can't answer that. I missed it for 17 years, but don't think I'm a complete idiot because everyone else had too. Chris - Shall we take a look at the actual cave site? Lee - What you're going to see is probably going to disappoint you enormously because it's so tiny. I think everyone who thinks of these sites that had images of these great East African rifts or huge cave sites. But this little wall in front of us which is 2 ½ by 3 meters, that brown area, from that area have come almost more early hominids than in any other spot in the history of this science. Chris - And this is basically a hole in the ground. It's 3 meters deep. It's maybe 5 meters at maximum extent across each dimension and as you say, an incredibly rich fossil legacy. Chris - Is that part of what I can see sticking out just there? Lee - That's part of a - that's not part of them. That's part of an antelope because there are also other bodies mixed in. It's this stack of bodies that clearly fell and were moved into position but as skeletons. Most of the animals here are articulated. Their pieces are in anatomical position and they're held together by remnants of their organic structure. Can you think how remarkable that is? Chris - How are you actually going to deal with this, given the enormous amount of material here? Are you going to slowly take pieces out? Are you going to take individual pieces out? Are you going to actually remove enormous amounts on block in the rock and then process them in the lab? How does one tackle this? Lee - The answer is, I can't answer you yet. We are engaging the entire scientific community around how we're going to do this because there's information preserved in this rock that may actually be one of a kind. It may be utterly unique. We have to be responsible in preserving that. The intent right now is to move with great care at a slow pace. We will attempt to remove large areas or moderate size areas of the rock in front of you and bring them into a controlled environment. So, we will very carefully map out the surfaces. We will very carefully identify where the edges of any one deposit are. We'll try to move it in its entirety, following along natural breaks and fractures. You can see where plants have dug into these, termites have opened this up. We will remove that rock, put it in a controlled environment because there has never been a case at least in our field of science where you are almost guaranteed to make extraordinary discoveries in every piece of rock you touch here. Chris - But how extensive do you think this is then? Lee - I don't know that either. That's going to be one of the exciting things about working in the site. I can give you some clues. Nature has given us a road map to this site in the form of these cluster of trees. If you look off to the east here, you can see a large white stinkwood tree that's perhaps 20 meters from us and behind us, this tree cluster goes another say, 10 meters or so. To the north of us, to our left here, towards the lightning struck tree, you can see a grove of trees, and then another 10 or 15 meters to the south of us, that's the perimeter of this cave. Where the trees are growing, the reason they're growing is they've got their feet in fossils. That's why they're there and so, they're signalling to us the potential of this site. And when you get beyond that, you're in that very, very ancient rock. So, what is that? 30 x 30 maybe? We don't know how deep it is, but if the kind of density continues that we're achieving right now, this really will be an extraordinary place. Chris - I think you need more palaeontologists. Lee - We do. You know, one of the lessons of this discovery is a poignant one for science. I think that there's so many people, particularly young people today think that we've explored this planet, that we've discovered all of the great discoveries that the age of exploration and discovery are gone. What we will do as individuals is stand on the shoulders of giants and add incrementally to our knowledge because the great age of discovery has ended. What this site tells us is a very different message than that because it sits right in the middle of perhaps the most explored area, not only on the continent of Africa, but on the planet for these very objects, for sites just like this. It went unrecognised for nearly 100 years and yet, sitting on the surface of the most explored area of the planet, in the middle of it was an object so easy to see that a 9-year-old could pick it up. That held not just another piece of these incredibly rare objects, but maybe the best ones ever found. And what does it tell us about other areas of science? It's got to be true if it's true here. So Chris, I'm going to let you do something that very few people get to do. You've held the Taung child in your hand. You've touched these sediba fossils. I'm going to let you touch an early hominid in situ, in place, and if you put your hand, you see these little white bones sticking out of this grey rock. If you put your hands on those, you're actually touching the other half of her body still encased in here. There is part of her pelvis. Here's part of her tibia, her shin bone going back in. The remainder of her body sits in here. That is an extraordinary thing because we are so often forced to rip these things from the ground and when we do that, it's a form of destructive behaviour in a sense that the context is lost. Here, you get to see a deliberate choice of us leaving this here for future generations and because we have the other half of her skeleton, we will eventually remove this out. But we may put it in fact in a time capsule. So, you're looking at a time capsule resource. You're seeing the future. I can describe for you what's in that and with the technology we're using, x-ray technology, when this is in the lab, I'll be able to tell you every piece of her that's in here, every position that it occupies. That's extraordinary. We wouldn't have been able to do that if this discovery have been made 10 years ago. Because of its time, we're able to apply technology and decisions about future science that just weren't there for other scientists. Chris - So, the new batch of research that's going to come out, what will you be reporting next? Lee - The 7 papers that are coming out in Science continue the sort of extraordinary exploration of the body of sediba. As you know, we've covered kind of the pop critical areas of human evolution. We've done the brain. We began to address the features of the face and taxonomy. We did the hand and it's a remarkably human hand. We did the pelvis because it's so related, how we give birth, how we walk, and we did the foot in those initial descriptions of the morphology. Well now, we get to the nitty gritty of this body. We link all those parts together and so, the series of papers coming out look at the dentition two of them, one is a review of all that has happened to date. We look at the thorax of the chest and its relationship to how sediba was moving across land - was it a runner? Was it walker? Was it a climber? We look at its upper limbs which linked the hand to the rest of the body. We look at the spine, something critical in bipedalism and particularly critical in humans as it's evolved different from all apes. And then we look at the lower limbs finally to assess how was sediba walking. And the short answer to that is, in a way we never imagined before. When you put sediba together, we see a picture very different than we had predicted from the more fragmentary previous fossil record. We see an animal moving in a bipedal way on two legs, but not in the way we have predicted, and perhaps walking with flatter feet and such. We see an animal with an upper body still adapted to some form of climbing whether that was trees or the cliffs you see or around you and yet all combined, perhaps one of the most mosaic systems of adaptation that we've seen in any mammal every discovered and that's exciting not only because we'd love to see that as evolutionary biologists from any mammal. But to see it in our own lineage is incredibly exciting. The dentition, we begin to explore where does sediba fit in this great story of human evolution and the answer is that sediba doesn't fit in any clear way to the story we'd been telling from the existing fossil record. It may very well be that ideas that we had that all later species descended from species like Australopithecus afarensis - "Lucy" species may not be correct. That is it does appear that sediba's dentition says it didn't come from at least that lineage of hominids and that may open the possibility of a ghost lineage, the one we haven't found, and that's exciting for palaeontologists. Chris - So, your reasoning would be that there was Australopithecus afarensis - the "Lucy" specimens that was in parallel with sediba or some other lineage that gave rise to sediba and that could've been the thing that then gave ultimately us. Lee - Well, the first part of your statement, the idea that parallel lineage appears to be almost certainly true. Then that opens up the next phase of the story and I think that's something that we kind of have to wait and see. Sediba shares a remarkable number of derived characters in really, really, important areas with definitive members of our genus, the genus Homo - its hands, its complex brain, the dental reduction, this unique pelvis, parts of the feet, and limbs. On the other hand, it has a lot of very primitive characters. We just don't know. Are those remarkable coincidences? Are they what scientists call homoplasies? They look similar, but they were evolved from different purposes? Or are they just what they appear to be? That is that they are effectively the progenitors of that morphology in our lineage. Both of those hypotheses are possible as well as perhaps others. It's a wait and see because you've got to remember that the sediba in some ways almost sits in glorious isolation. For 200, 300,000 years on either side, you could put every single other fossil discovered on this continent in a small suitcase and still have room to pack for a weekend away. Chris - Though the interpretations then, it could be that sediba sits there on its own, it evolved some of the traits we've got for the very same reason that we evolved them, but that Lucy, Australopithecus afarensis, ultimately still gave rise to us and that sediba was just an isolated example or in some way, it is linked to us and was our immediate ancestor and Lucy wasn't, or a combination of those. Lee - That's right and I mean, there will be probably a point where we have to ask if it walks like a duck, if it quacks like a duck, if it flies like a duck, is it a duck? But sometimes science isn't that easy. Chris - But how has this, what must amount to a rather controversial interpretation gone down because this field is a small field in a sense that there are some very powerful people working in it, but not many of them. So, how have they reacted to these finds and your interpretation of them? Lee - Well, I'll tell you tomorrow since these papers are literally probably out as we speak. I can't answer that. I can tell you that no field of science likes its sacred cows slaughtered and palaeoanthropology is no different. Perhaps more so than it has been a field of fragments. It isn't going to be a field of fragments for very long and these fossils form a part of that new generation of evidence. Chris - I still can't believe I'm standing on 2 million years of human evolution here. What else can I see as I stand in this hole? Just point them out to me because they are pretty subtle. I mean, I wouldn't, if I stood in this hole, have realised there is the bottom half of a female from 2 million years ago. Chris - So, this is the first one that came out. Lee - The first one. Literally an arm length away from me, his body, left hand side of his body sits within arm reach of this in front of us at head height. Up here to the left of us where I reach my hand up, just above my head is the foot of another skeleton. There's another child lying right in here and you can see the little bits of yellow bone that represent that articulated foot in position. And then we're going to do some climbing. We're going to climb up the face of this rock only a meter or so and you're going to start seeing fossils that are not so unobvious to you. As we cross on to this little platform which is no more than say, a meter above us, I can have you put your hand on the jaw of a large antelope skeleton that extends here. And here, you can clearly I hope see the teeth of that antelope in place, the shattered remains of its jaws, but what's even more exciting is right next to it. There's - I just push away a little bit of this dirt, you'll see the back of a mandible. You'll see a large tooth in place, that's the head of a sabre-toothed cat. The skull is back in our lab. Its body is still in place extending here. Here, its upper limbs going out in this direction and lying right under where my hand is, which if you imagine almost this cat curled up on its side like a sleeping cat, right underneath my hand is the skeleton of a little sediba baby, about 18 months old. We struck its arm which was lying - its body was lying right on top of this cat and then we stopped because the bones of an infant of that age are incredibly fragile and incredibly precious because we learned so much about the life history. And it's sitting right here underneath this dirt. Chris - People might think that we're in some giant grotto or something. We're literally almost at surface level again in this pit and this is what? Only a foot below the surface? Lee - Not even that. Chris - So, it's extraordinary that it's there and hasn't been weathered away in 2 million years. Lee - What is extraordinary about it too is that at the rate that this rock is eroding, we had a tiny window in time for this. If we had come 100 years ago, we would not have seen this because the miners wouldn't have opened this up. Literally, we would've walked across this almost in the way we've walked across this trail and we might have seen some trees, but we wouldn't have seen this as special at all. 100 years from now, this will probably be gone. It's that narrow. When you think that we might have had a 200-year window in 2 million years. Chris - Is an argument for erecting some kind of shelter over this to preserve it because you know, Johannesburg is not known for its gentle delicate weather, is it? Lee - No and in fact, you might've noticed there are some blue bags and metal upright poles in a sort of semi-circular arrangement around the exterior of this hole. That's going to be a state-of-the-art lab funded by the South African government put over this to protect it and allow us to deal in a paced manner with the extraordinary preservation here - the organic material. The questions you've asked before, how are we going to get this stuff out? Some of it remains to be answered, how are we going to do that. What we do know is it needs protection and that's going to be that. So, you're at a privileged - very few people come here as you might realise. This area is off limits for very obvious reasons in this beautiful game reserve, but you are some of the last people to come here before this place will be changed forever. It won't be this little natural hole in the ground. It's going to be an active scientific lab within months and so, it's kind of neat to stand here in this pristine wilderness and see the future, but also, get a taste for what the past was like. Why did dinosaurs achieve so little? Is bone tissue replaced by fat as we age? Do smaller organisms evolve faster? How does a bagless vacuum cleaner work?